20 NM. DENSE FOG ADVISORIES MIGHT BE NEEDED. How does the GOES-R IFR Probability field handle this event? IFR Probabilities are correctly limited to coastal regions of east Texas, with high values off shore. The brightness temperature difference field has difficulty identifying regions of low clouds over the Gulf of Mexico because of southwesterly flow aloft that contains mid- and high-level cloudiness. The relatively flat field over the Gulf — large values, but little variability — correspond to regions where high clouds exist. These high clouds prevent satellite predictors from being used in the IFR Probability algorithm because the brightness temperature difference does not observe low clouds, so only the Rapid Refresh model output is used to compute the IFR Probability. Therefore the IFR Probability fields are a bit flatter. Where there are breaks in the high clouds, the brightness temperature difference field can be used in the IFR Probability algorithm, and the computed IFR Probability is larger. In addition, the character of the probability field is more pixelated like a satellite image. 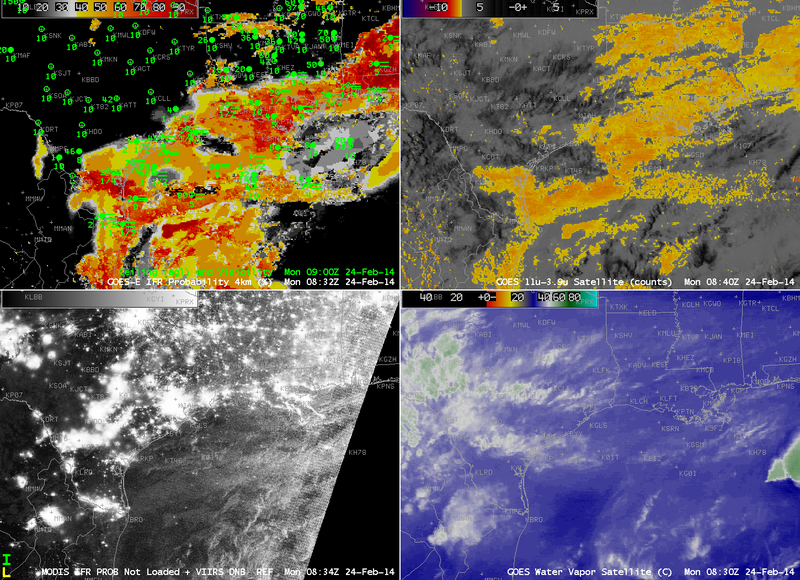 The bottom left image in the 4-panel composite above includes both the Day/Night band from Suomi/NPP (an image that — because of scant lunar illumination — gives little distinct information about the clouds present) and a MODIS-based IFR Probability field. For selected still imagery of ~0830 UTC Suomi/NPP click here; click here for ~0730 UTC MODIS-based IFR probability. This entry was posted in Day/Night Band, MODIS, Suomi/NPP, Texas on February 24, 2014 by Scott Lindstrom. Fog and Low clouds resulted in IFR conditions along a long swath of the western Gulf Coast today. IFR Probability fields warned of the development of these conditions long before a strong signal appeared in the traditional brightness temperature difference fields. The animation above, of hourly GOES-R IFR Probability fields (and surface observations of ceiling and visibility). There are indications by 0615 and 0702 that fog/low stratus is developing, and those indications are matched by some observations of IFR conditions. By 0915 UTC, widespread IFR conditions are present from southwest Louisiana southwestward through coastal Texas. MODIS data can be used to generate IFR Probabilities as well, as shown above. 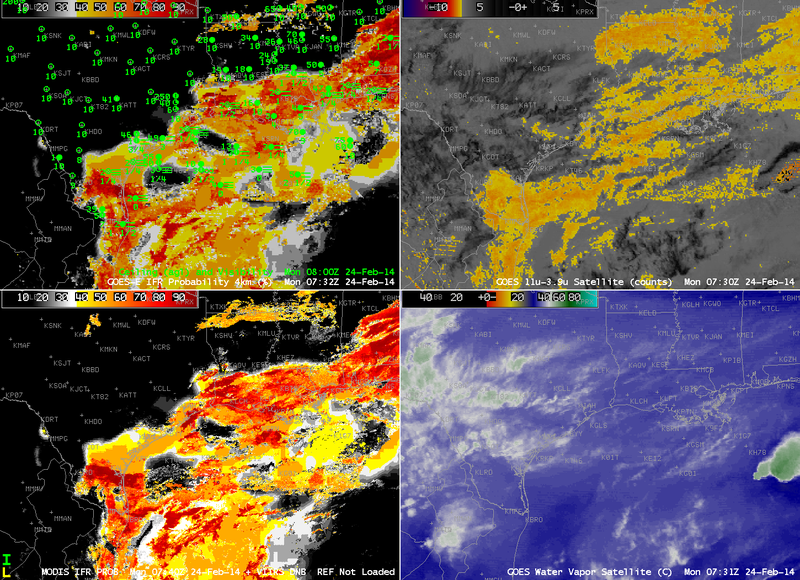 The MODIS-based and GOES-based fields both generally overlap regions with developing IFR conditions. The MODIS-based Brightness temperature difference product (called MODIS FOG in the image annotation) shows little signal in central Louisiana/east Texas (near Lufkin, for example) or southwest of Houston, two places where near-IFR conditions are developing (and where the IFR Probability fields have a signal). Suomi/NPP data (Brightness Temperature Difference fields, and the Day/Night band) from the same hour (0822 UTC) as the MODIS data similarly underpredicts the areal extend of the developing IFR conditions. The animation above shows hourly views of GOES-R IFR Probability and GOES-East Brightness Temperature Difference fields. There is little discernible signal in the brightness temperature difference field until about 0915 UTC (several hours after the IFR Probability field has been suggesting fog development). Thus the GOES-R IFR Probability field is giving better lead time is diagnosing where visibility restrictions might occur/be occurring. In addition, the GOES-R Cloud Thickness product shows that the thickest fog/stratus field just before sunrise is just east of Austin/San Antonio, and that is the last region to clear out after sunrise. The presence of high clouds has an effect on both the IFR Probability fields and the brightness temperature difference field. When high clouds are present (in the brightness temperature difference enhancement used, high clouds are dark), IFR Probabilities drop in value and the field becomes flatter because satellite data cannot be used in the computation of the IFR Probability Field. This entry was posted in Day/Night Band, Deep South, MODIS, Suomi/NPP, Texas on February 14, 2014 by Scott Lindstrom. Cold air dropping southward through the southern Plains is sometimes shunted westward towards higher elevation on the Equatorward side of the Polar High that anchors the cold air. That upslope flow facilitates the development of fog and low stratus. That was the case today, and the southward and westward movement of low clouds/fog is obvious in the IFR Probability field animation shown above. Much of the High Plains south of Kansas had reduced visibility and lowered ceilings, and IFR Probabilities were high. The IFR Probability field does a better job of outlining where the low clouds associated with IFR Conditions are present. Compare the half-hourly loop above to the hourly loop of the Brightness Temperature Difference (10.7 µm – 3.9 µm), below. Regions with multiple cloud layers show little signal in the brightness temperature field, and the flip in signal at sunrise — as 3.9 µm radiation from the Sun is reflected off the clouds, overwhelming the emitted signal — is obvious. Polar-orbiting satellites can give high-resolution views of scenes. Suomi/NPP carries the VIIRS instrument, which has a Day/Night band and 11.35 and 3.74 µm channels, shown below in a toggle. Of course, these views are telling you something about the top of the clouds only. Whether of not visibility/ceiling restrictions are happening is unknown. GOES-R IFR Probability algorithms have not yet been configured for Suomi/NPP data (such a configuration is complicated by the lack of a water vapor channel on VIIRS). The characteristic signal of high clouds — dark features in the enhancement used — shows up in the VIIRS Brightness Temperature Difference field. MODIS data includes water vapor imagery, and thus GOES-R IFR Probability fields can be computed using MODIS data, as shown below from 0907 UTC. This toggle includes MODIS-based Brightness Temperature Differences, MODIS-based GOES-R IFR Probabilities, GOES-based GOES-R IFR Probabilities and GOES Brightness Temperature Differences. The shortcoming of the MODIS-based data is obvious (it doesn’t view the entire scene), but its strength (excellent spatial resolution) is also apparent. This entry was posted in Day/Night Band, MODIS, Plains, Suomi/NPP on February 10, 2014 by Scott Lindstrom.